The challenge of expanding access to education is central to creating an equitable and thriving society. Yet, overcoming structural inequalities demands more than mere access. Research shows a significant gender gap in both enrollment and achievement when it comes to scientific and technical education. This gap also occurs in the online learning world — sometimes, it’s even wider. We would like to suggest a few strategies that promote equal opportunity and help diverse communities of learners succeed. 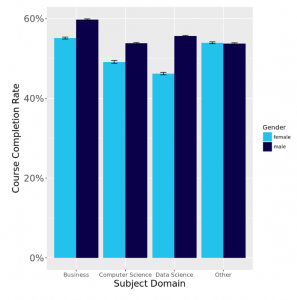 In business, data science, and computer science courses on Coursera, male learners are 5% more likely to complete courses when compared to female learners. Coursera’s data shows that the gap between male and female learners widens even more for learners who score poorly on their first assignment. Using machine learning tools, we’ve found that targeted review material for struggling learners (a video in this case) significantly boosted exam completion rates and continuation rates for female learners. The review material had no effect for male’s performance. The results suggested that small behavioral interventions can positively impact learning outcomes specifically for females, thus reducing gaps between genders. To learn more about this experiment, stay tuned for an upcoming post on Medium. Provide learners with actionable feedback: research shows that immediate and actionable feedback on assessments can support better learning outcomes. Feedback supports all learner’s success, but females can benefit even more, thus reducing gender gaps. As mentioned above, females are more likely than males to succeed after reviewing relevant content when struggling. There are several ways to offer effective feedback on Coursera. One is embedding a short video in each of the answer options in a quiz. Using videos in online quiz feedback shows a significant positive impact on learners’ progression rates. Encourage learners to try again: the Coursera platform is designed around the concept of mastery learning. Mistakes are an important part of the learning process. Believing one can learn anything and embracing failures as milestones in that process are crucial for success. Therefore, encouraging learners to grow from feedback and try again until achieving mastery, can help foster a growth mindset. Walk through common pitfalls: in your course materials and assessment feedback, highlight common mistakes and explain them. This is an additional channel that learners can use to process difficult concepts. Intentional data analysis can surface targeted areas for improvement to benefit learners and especially underrepresented groups. Small interventions can go a long way to support a more inclusive learning experience. Encouraging learners to develop a growth mindset with effective learning design strategies can make all the difference. As educators, there’s so much you can do to reduce the gender gap and foster an inclusive learning environment. We look forward to partnering with you to explore innovative tools that help learners around the globe. The post A Growth Mindset Can Reduce the Gender Gap in STEM appeared first on Coursera Blog. New Free Courses with Google!